As mentioned before, a group is an object type that doesn't fit easily into one category because of its dual nature. Much like light that behaves like a wave and a particle, a group has properties that make it behave like a card at times and like a control object at others. Because of this the concept of groups can be difficult to grasp at first, but once mastered it is a very flexible and powerful tool. What is a group in LiveCode? In what ways are groups like cards? In what ways are they like buttons and fields? What is unique about groups as compared to all other object types in LiveCode? What does it mean to place a group on a card? Know the difference between removing a group and deleting a group. You can put objects into a group by selecting one or more objects already existing on the card and by choosing Group Selected from the Object menu (there is a button on the toolbar for this as well). This creates a new object within the stack called a group. When objects are grouped, ownership is taken away from the card they were on originally and is transferred to the new group. The group now "owns" the objects, while the group’s objects remain visible and accessible on the card. The bottom left image represents a card in the same stack that does not have the group placed on it. The bottom right image represents a card on which the group has been placed. In terms of inheritance, the new group exists as sort of a hybrid "sibling-child" of the existing cards. In other words, it is like a sibling because it is owned by the stack and maintains its identity independent of the card. A group is also like a card in that it can contain control objects. It is subject to all the nuances of inheritance: inheriting properties from the stack and passing on properties to the objects it owns. Changes made on the group level will be reflected in the objects that it owns. However, a group also behaves somewhat like a child to a card in that it inherits properties (e.g., text and color) from the card it is placed on, then passes those on to the objects it contains. Finally, a group has no visible presence in a stack unless it is placed on a card. Since groups are objects, they can even be placed inside other groups (unlike cards). You can create a nested group simply by selecting a group and other objects you want grouped and then group them as described above. This group is now part of another group. While this may be somewhat nifty, it does create a level of complexity that we don't wish to explore right now. 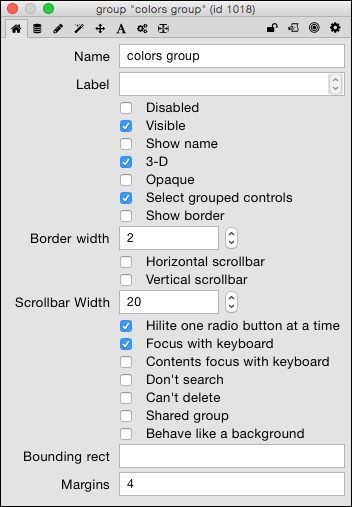 Hiliting one radio button at a time: For radio style buttons that are in a group, checking this box makes it so that only one button in the group can be highlighted at the same time. This option is only available if at least one radio button is contained within the group. This group will be automatically placed on a new card if the group is present on the current card. This is not the default setting for a group, so this must be selected in order for a group to placed automatically when a new card is created (per conditions explained above.) But be aware that once you place a group on more than one card, it is considered a background group by LiveCode, and this property is set to true automatically. Shared group: When this property is checked a group can exist on more than one card, but it is not considered a background, therefore the two points mentioned above under Behave like a background do not apply. display an existing group on a card. Go to the card you want the group to be on and choose the group from the Place Group menu item on the Object menu. The text in the fields of a group can be different on each card that contains that group. To make the text of a field the same on each card, you need to select the Share text property in the basic properties for that particular field. This is arguably the most powerful function of groups: its ability to enable objects to exist simultaneously on several different cards. Not only does it save time in the creation process, but it engenders a sharp and consistent layout for your stack. It is a principal part of intelligent stack design. To associate several controls into a single group for ease of formatting or rearranging your layout; or because the controls need to interact in some way. For example, if you want to have a set of radio-style buttons, which let the user make “mutually-exclusive” choices, you need to group them. When you do that, LiveCode will automatically un-highlight previously highlighted buttons in the group. To place the same controls on multiple cards. Often, for example, you may want to have buttons on every card of your stack that allow you to go to the next and previous cards in the stack. In cases like these, it is best to create the Previous/Next buttons on a card, group them, then place the group on all of the cards in the stack. The main advantage of this approach are obvious: if you have buttons that do the same thing on each card, and you use a group, the buttons stay in the same location on each card, have the same appearance on each card, and if you have to make a change to a button, you only have to do it once, instead of once for every card in the stack. Despite being part of a group, the component parts of a group can be edited separately. To edit the components of a group, select the group and choose Edit Group from the Object menu. Now that you are in edit mode, you can click on individual objects in the group and edit them individually. The changes you make will be shown on all cards containing that group. Choose Stop Editing Group from the Object menu to return to the group selection. There are also buttons on the toolbar to accomplish the same ends. You can also edit items in a group without entering Edit Group mode. This can be important, for example, when you want to see the relationship of objects in the group with objects not in the group. By default, when you click on an object in a group in the LiveCode development environment, the whole group is selected. However, you can change this behavior by choosing the Select Grouped Controls in the Edit menu or by clicking the Select Grouped icon on the tool bar. In this mode, clicking on an object in the group will only select the item clicked on, not the group. This allows you to edit each component of a group separately. If you have created a group and decide that you no longer want the objects to be together in this group, you can ungroup them. 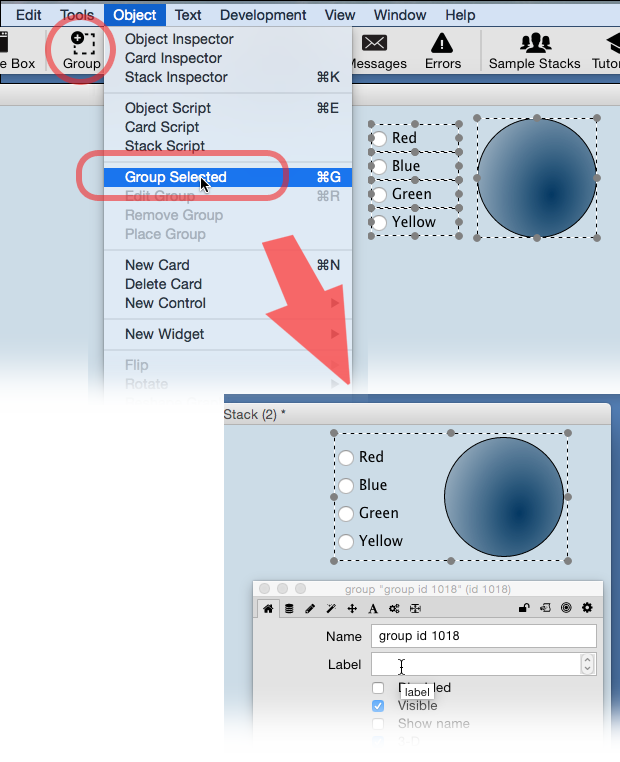 Simply select the group, go up to the Object menu and choose Ungroup Selected. 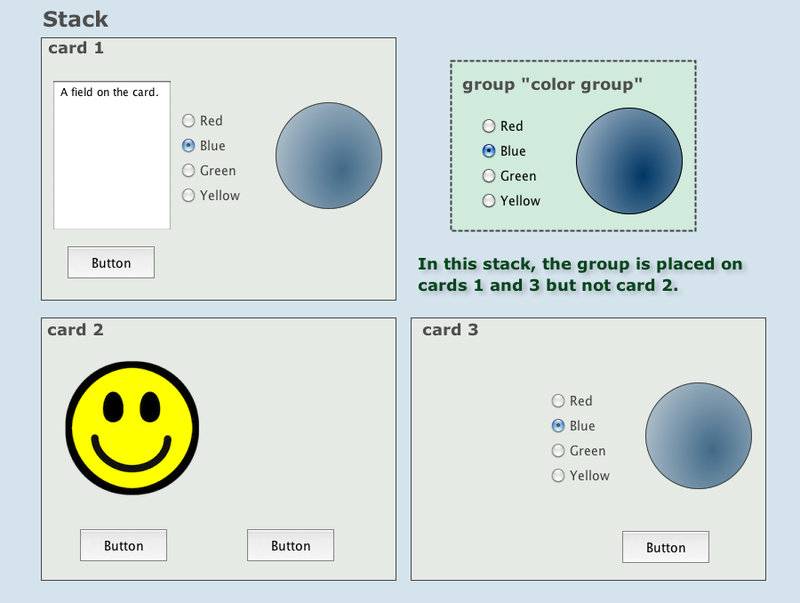 This will delete the group from the stack and will place on the current card all the objects formerly within the group. Please note the implications of this: Since the group no longer exists, it will not display all those objects on the cards where they were formerly visible. Ungroup items with caution. Note: If you accidentally ungroup the objects in a group, there is hope! Re-grouping the the same objects immediately, before moving from that card will restore the former group to all the cards on which it was placed. Sometimes you want a group to show up on multiple cards in the stack, but not ALL the cards you create. Removing a group from a single card is simple. Select the group then choose Remove Group from the Object menu and the group will be removed from the current card only. Removing a group from every card in the stack does not remove it from the stack. 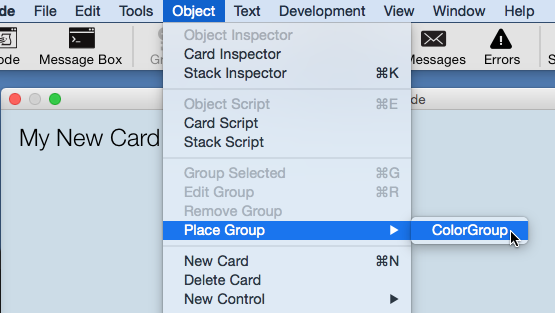 It is still part of the stack and can be placed on a card by choosing the Place Group command in the Object menu. To completely delete a group from the stack (and consequently all the objects it contains), select the group and hit the Delete key. You may also select the group and choose Cut Objects or Clear Objects from the Edit menu. A dialog box will appear asking you to confirm that you really want to delete the group. Clicking "Yes" will delete the group from all cards on which it is found and delete it from the stack as well. Please note that all objects contained within the group are obliterated as well. Again, use with caution.